Mere days after a crazed deer crashed through the front window of a doctor’s office in a small southern community in Ontario, another one took the plunge through a law firm window. CTV News reported the incident occurred in Tillonsburg on Wednesday, and construction worker witnesses described seeing a “four-point buck” jump through then window and back out again, before running away. The week before, a deer who had smashed through the window of a doctor’s office had to be gently coaxed out the back door by police officers. Luckily no-one was hurt in either of the deer rampages, but there was certainly plenty of glass to sweep up. But that’s not all – earlier this week a home owner awoke to find a young buck had crashed through her window and was happily standing in the living room. It then jumped out through another window and trotted off into the woods, she says. 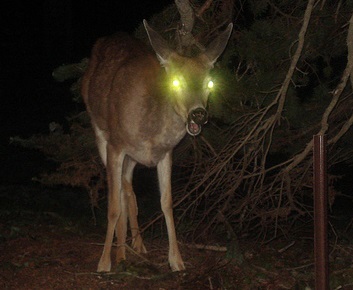 Perhaps the deer revolution is nigh?